This caricature shows Frederick Ranalow (1873-1953) in Autumn Crocus at the Brighton Theatre Royal on 30 March 1932. It was drawn by Gilbert Sommerlad (1904-1976), a rehearsal pianist and orchestral violinist at the Brighton Theatre Royal from 1932 until 1936, and at the Oxford New Theatre from 1936 for over forty years. Sommerlad sketched the stars on stage when he wasn't needed in the orchestra pit, compiling the sketches in a series of albums. Frederick Ranalow played Herr Feldman, 'the hot gentleman' in C.L. Anthony's play about an inhibited, bespectacled school teacher who falls in love with a handsome inn-keeper whilst holidaying in the Austrian Tyrol. The play was a success in London at the Lyric Theatre where it opened in April 1931 with a cast including Francis Lederer, Martita Hunt, Jessica Tandy, Jack Hawkins and George Zucco. The post-London tour visited Brighton for a week, commencing 28 March 1932, with Fay Compton and Frederick Ranalow in their original roles, the only two London cast members to do the tour. 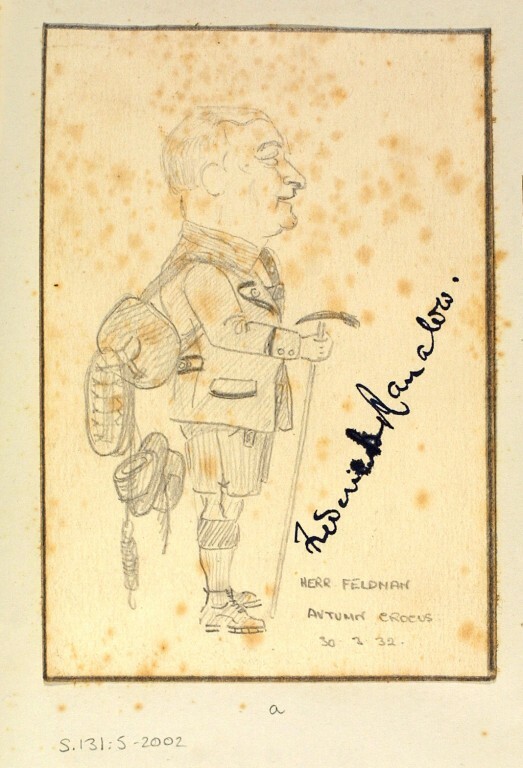 Pencil caricature of Frederick Ranalow as Herr Feldman in Autumn Crocus at the Brighton Theatre Royal. Dated 30 March 1932. From a hard-backed sketch book containing caricatures of theatrical performers and entertainers drawn by Gilbert Sommerlad. This production of Autumn Crocus by C.L. Anthony opened at the Theatre Royal Brighton on 28 March 1932, starring Fay Compton and Frederick Ranalow, after its production at the Lyric Theatre, London. There was a programme of interval music credited in the programme which Gilbert Sommerlad would have played as part of the resident orchestra at the Theatre Royal Brighton when he drew this caricature. Frederick Ranalow played Herr Feldman, 'the hot gentleman' in C.L.Anthony's play about an inhibited, bespectacled school teacher who falls in love with a handsome inn-keeper whilst holidaying in the Austrian Tyrol. The play was a success in London at the Lyric Theatre where it opened in April 1931 with a cast including Francis Lederer, Martita Hunt, Jessica Tandy, Jack Hawkins and George Zucco. Frederick Ranalow and Fay Compton and were two of the original cast members who did the post-London tour which visited Brighton. 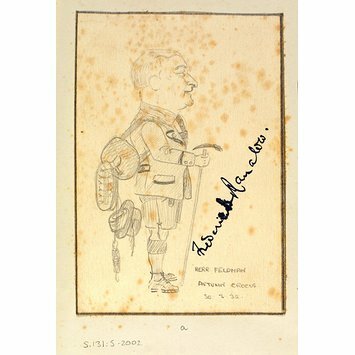 Pencil caricature by Gilbert Sommerlad (1904-1976) of Frederick Ranalow as Herr Feldman in Autumn Crocus at the Brighton Theatre Royal. Dated 29 March 1932.